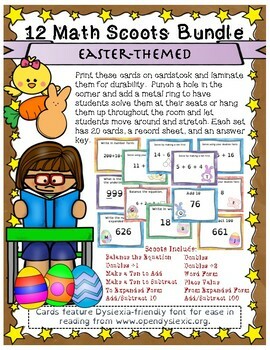 This bundle of scoot cards includes 12 sets of cards and over 80 pages. 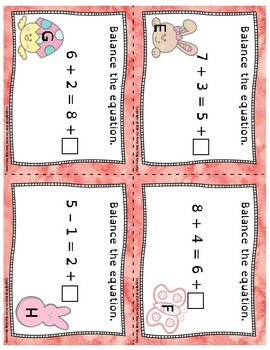 Each set has 20 cards, a recording sheet, and an answer key with cute Easter-themed graphics. 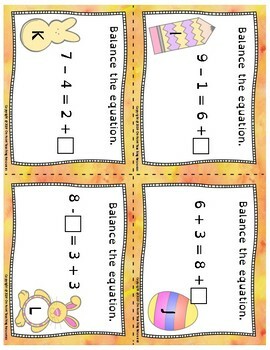 With these sets students can practice: making tens to add, making tens to subtract, place value, adding/subtracting 10 and 100, numbers in word form, numbers to and from expanded form, balancing equations, doubles, doubles +1, and doubles +2. 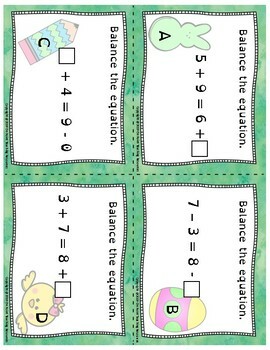 Cards feature Dyslexic-friendly font to help with readability. These sets are also available individually in my store but save money here by buying the entire set.